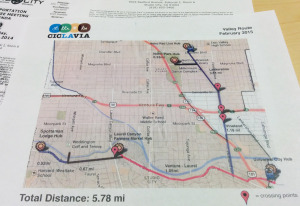 Last week, CicLAvia announced the final details for the March 22nd Valley event. While we knew it was coming and where the general route would lead, there were still question marks about the final details. Now that we can look a bit closer at it, here’s some quick thoughts. Overall, you couldn’t ask for a better route in the valley. You get some of the area’s best restaurants, a bunch of valley history and two subway stops to bring people from over the hill. I wish that the Ventura Blvd. portion would have been extended down to Van Nuys Blvd. or Sepulveda Blvd., but we’ll save that for another time. 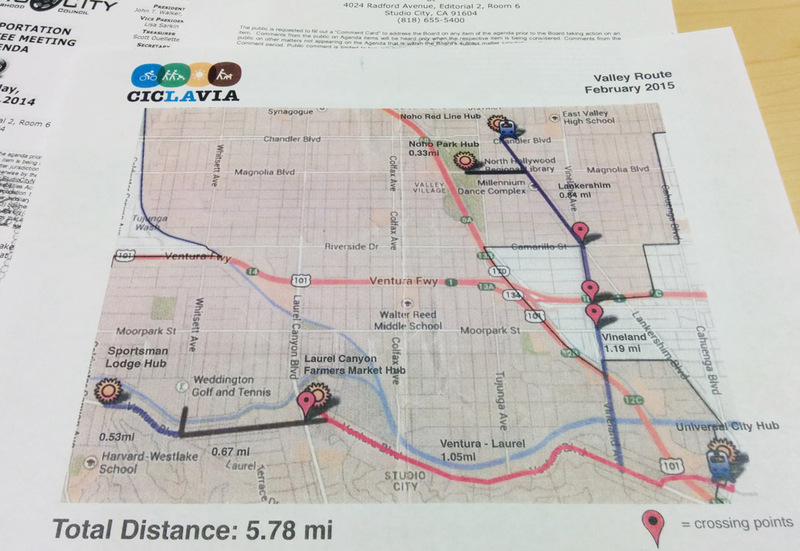 The biggest difference between this route and the preliminary one released last year was the elimination of the Vineland stretch opting instead to continue down Lankershim Blvd. down to the Universal City Station. I call this a big win as there’s not much of interest along that stretch of Vineland. You can see this from the map on the right. The little extension down Magnolia to Tujunga was also eliminated. Not a big loss either, unless there were plans to hold more activities at North Hollywood Park. Most of the car crossings make sense. I would have voted against the Lankershim crossing at Moorpark, but St. Charles Church has a large following for its Sunday services, so I understand. Car traffic will be allowed on Lankershim between Cahuenga and Ventura Blvd., leaving only half the street for CicLAvia, but the street should be wide enough to accommodate both. It’s too late for this to come together, but it would be cool if someone like Wolfpack Hustle had a drag race up the hill at Universal Studios. I’ve always wanted to know what it feels like to climb that thing. 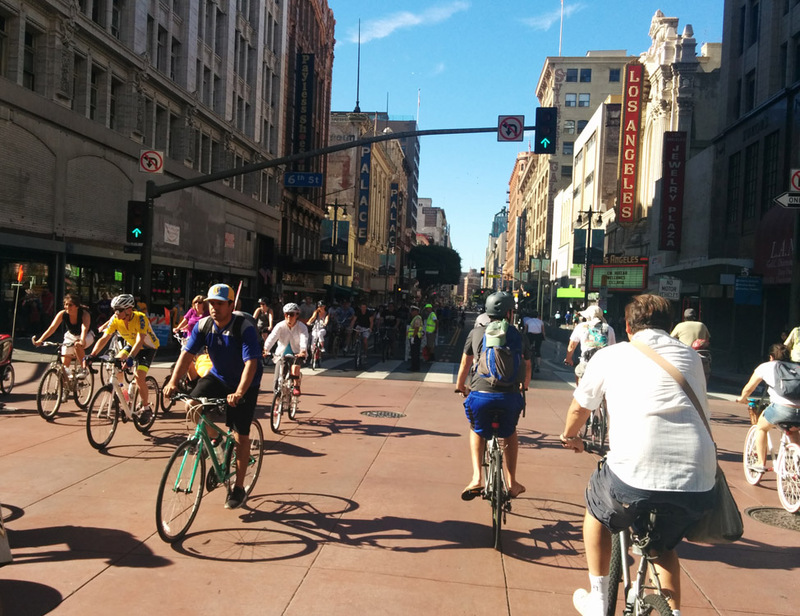 The pedestrian zone around Campo de Cahuenga is smart, not just from a historic perspective, but to slow cyclists down descending the 101 freeway overpass. There’s only one crossing along Ventura Blvd., which sounds light, but the one planned at Laurel Canyon is really all you need. All the residents living south of the Boulevard should know all the tricks of getting around the neighborhood by now. The six miles course doesn’t sound like a lot, but from what we learned from the South LA event, it’s plenty especially with all the action that should line Lankershim and Ventura. Remember, that’s twelve miles going back and forth! Tuesday Night Racing Back at the Encino Velodrome!